"Er fühlt sich gerade auch gut und ist entspannt, aber das wird sich leider wieder ändern und dann werde ich ihn seine letzte Reise antreten lassen müssen, bevor er Schmerzen bekommt." It is all over for King Loui I. The end came for the gray and brown cat on August 22nd when his owner, thirty-six-year-old Nadine Biewer, took him to an unidentified veterinarian and paid that individual to end his life. "Manchmal muss ein König seine Krone ablegen, damit ihm Flügel wachsen konnen,!" is how that she informed the world of that heartbreaking news in an untitled article posted that same day on the Facebook site, Aachener Campuskatze. "Gute Reise, kleiner Schatz. Ich werde dich immer lieben!!!" Over the course of the past several years, Loui had become famous around Aachen through his almost daily visits to the sprawling urban campus of Rheinisch-Westfälische Technische Hochschule (RWTH), the Aachener Cathedral (the Dom), its museum, Domschatzkammer, and Burgerservices am Katschhof as well as numerous businesses and cafes in the Innenstadt. He additionally had attracted a large international following online that included more than six-thousand friends on Facebook as well as hundreds of others on Instagram, Twitter, and Jodel. Although all of that is now a thing of the past, he is destined to live on in Biewer's recently published e-book, Die Fellnasenbande. Hinter dem Gartenzaun. A print edition also is in the works and that should help even more in keeping his memory alive. 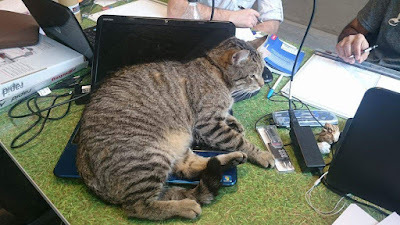 The first inkling that anything had gone awry with the intrepid moggy came out of the blue on July 20th in the form of a startling and worrying article posted on Facebook. "Loui ist sehr Krank!" Biewer wrote. "Gestern Abend mussten wir als Notfalls in die Klinik nach Brand (south Aachen), weil er ununterbrochen und sehr stark aus dem Maul geblutet hat." While he was there the attending veterinarian, tragically, discovered a growth underneath his tongue. "Er ist aber immer noch sehr schwach und wir können noch nicht sagen, was genau dahinter steck, ob bösartig oder behandelbar," Biewer revealed in a July 24th posting on Facebook. "Das er frisst und wesentlich 'lebendiger' wirkt, lässt mich allerdings hoffen." In addition to being very weak and bleeding from the mouth, Loui was running a temperature and had lost five pounds. The anesthesia that the veterinarian had given him prior to examining him also caused him to stop eating and that necessitated in Biewer having to hand-feed him. In an effort to help defray some of the costs of his escalating veterinary care, an appeal was quickly established at Crowdfunding-Aktion with the goal of raising €2000. Of that total, €1940 was soon amassed and additional funds likely came in later. Since he had so loved his freedom, Biewer some days granted Loui supervised time outside. "Wenn er möchte, darf er auch unter Aufsicht ein paar Stunden nach draußen," she disclosed in a July 28th posting. "Alles was ihm Freude macht, ist erlaubt." On August 1st, Loui observed his seventh and last birthday but the occasion far more resembled a wake than it did a celebration. Although by that time his strength had all but dissipated, Biewer nonetheless took him over to RWTH for one last, brief visit. The worst was still yet to come, however, and it did not take it long to arrive. "Ich würde so gerne etwas positives berichten können, aber das kann ich leider nicht," Biewer mournfully acknowledged in an August 7th posting. "Louis Blutwerte sind so katastrophal, dass es schon an ein Wunder grenzt dass er überhaupt noch lebt." Although weak and steadily losing ground, he bravely soldiered on as best he could until at last a visit to yet still another veterinarian, this one located in Mönchengladbach, sixty-five kilometers north of Aachen, confirmed what Biewer and his legions of fans around the world had long suspected and feared. "Trotz all der Bemühungen in den latzten Wochen wird es keine Heilung für Loui geben," Biewer revealed in an August 13th posting on Facebook. "Krebs ist einfach ein Arschloch!!" Loui was administered a painkiller and then sent home to spend some time with Biewer and her other resident feline, Mia. "Er hat jetzt nochmal ein Cortison gespritzt bekommen, damit er sich gut fühlt und seine letzten Tage zuhause ohne Schmerzen verbringen kann," Biewer continued in the August 13th posting. She did not, however, have any intention of allowing him to die a natural death. "Er fühlt sich gerade auch gut und ist entspannt, aber das wird sich leider wieder ändern und dann werde ich ihn seine letzte Reise antreten lassen müssen, bevor er Schmerzen bekommt," she vowed. Even though her palaver about a "letzte Reise" sounds much more like something that would have come out of the maw of a gangster than that of a devoted cat owner, she nevertheless insisted that she was going to find it difficult to go on without him. "Ich weiß gar nicht was ich noch schreiben soll, es zerreißt mir einfach das Herz und ich kann mir ein Leben ohne ihn einfach nicht vorstellen," she concluded on August 13th. Nothing has been disclosed concerning Loui's last days so it is impossible to speculate upon either how much discomfort he was in or how much longer he could have held out had be been treated and made comfortable. It has not even been revealed which of the many veterinarians that treated him actually committed the foul deed. The only thing that is known for certain is that his corpse was afterwards burned to ashes. What ultimately became of them is anyone's guess. Despite hiring an unscrupulous veterinarian to kill off her cat, Biewer to this day is still professing her undying love for him. "Loui hat sein Leben, auch wenn es viel zu kurz war, in vollen Zügen genossen und werde von der ersten bis zur letzten Sekunde geliebt," she wrote September 2nd on Facebook. "Dieses Glück sollte jedem Tier gewährt werden!" In addition to the patented immorality of robbing a cat of so much as one second of its all-too-brief life, Biewer's guardianship of Loui left much to be desired and that is putting the case rather mildly to say the least. In particular, each day she would carry him downstairs from her upstairs apartment at 20 Annuntiaten and transport him three-hundred-eighty-two yards or so to RWTH where she would dump him. He therefore was left to his own devices until she picked him up again in the evening and brought him home. In order to facilitate relocating him, she forced him to wear a bulky tracking collar but even in doing so she had difficulty keeping batteries in it. Biewer deliberately chose that heartless course of action so that she could gather material in order to both augment her presence online as well as to write her book. For whatever it is worth, she nonetheless would have the world to believe that her abject neglect of Loui was all his idea. "Ich habe die ganze Aufmerksamkeit nie beabsichtigt oder geplant," she averred to the Aachener Zeiting on May 27th. (See "Campuskater King Loui I stellt die Stadt auf den Kopf.") "Loui liebt einfach die Menschen, und die Menschen lieben ihn." Even though she had collected enough material for several more books, even that did not tempt her to bring Loui home. "Stoff für viele weitere Abenteuer der Fellnasenbande habe ich jedenfalls mehr als genug," she candidly admitted to the Aachener Zeitung on May 27th. A good case therefore could be made that the type of love that Biewer harbored in her bosom for Loui was of the distant and frosty kind that would have given any cat a bad case of the shivers even on a hot summer's day. Moreover, the picture of her that emerges from her online presence is that of an ambitious young woman who cares considerably more about gassing on social media and taking in Aachen's vibrant club scene than she ever did about Loui. Although the likes of PETA, shelter operators, and veterinarians would sans doute wholeheartedly endorse her killing off of Loui, it is an abuse of language to label such a heinous act as an expression of love. Im Gegenteil, what members of the species so direly need are responsible and attentive owners who are knowledgeable about the perils that they face in this world and, above, possess an abiding respect for their right to life. The utterly worthless sods at RWTH were likewise willing participants in her abject neglect and naked exploitation of Loui. Most revealing of all, their slightly premature eulogy of him demonstrated beyond the shadow of a doubt that they are so self-absorbed and egotistical as to be thoroughly incapable of having any genuine regard for another living being. "Für den Campuskater und seine Besitzerin tun uns die gesundheitlichen Entwicklungen sehr leid," Julie Goths of the Allgemeine Studierendenausschuss (AStA), a student organization, told the Aachener Zeitung in the August 14th article cited supra. "Vor allem die Fachschaften rund um das Kármán-Auditorium hatten mit King Loui einen treuen Begleiter, der immer wieder für Freude gesorgt hat. In den letzten Jahres ist er zu einer kleinen Ikone des Aachener Studi-Lebens geworden." The abject failure of RWTH's almost forty-five-thousand students, nearly six-thousand professors, and more than thirty-three-hundred administrators to have taken concrete steps in order to have safeguarded Loui's fragile life was a far worse offense and yet none of them have been held accountable under the law. Perhaps if rector Ernst M. Schmachtenberg were given a year in jail for malfeasance that might in the future serve to make him a little bit more cognizant of animal welfare issues. 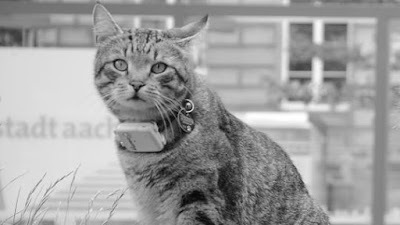 The school also likes to think of itself as being on the cutting edge of technology and even has adopted Zukunft denken as its high-falutin motto, but when it comes to its mistreatment and naked exploitation of Loui, and presumably other cats as well, its thinking is strictly a product of the Stone Age. In Deutschland verstehe man Hochschulbildung als "ein öffentliches Gut, eine Ausbildung von Fachkräften, vor der auch die öffentlichkeit profitiert," Brigitte Göbbels-Dreyling of Hochschulrektorenkonferez of Bonn bragged to Deutsche Welle of Köln on February 24th. (See "Ranking bestimmt Attraktivität deutscher Unis.") Im angelsächsischen Raum sehe man dagegen "eher die Vorteile, die der Einzelne daraus zieht, etwa bessere Berufsaussichten und ein höheres Einkommen." Whereas it is readily conceded that American universities are thoroughly incapable of churning out anything other than capitalists, militarists, propagandists, crooked politicians, and other assorted low-life, their German counterparts are not necessarily any great shakes. In particular, when it comes to how that they defame, abuse, and exploit cats their ranks are comprised almost entirely of moral and intellectual retards. Presumably, Loui was vaccinated against both FeLV and FIV so that would tend to eliminate them as the culprits. Since it is not known if Biewer is a smoker or if such activity is permitted in the classrooms at RWTH that Loui used to frequent, it is impossible to pass judgement on tobacco as the possible cause of Loui's cancer. The most obvious culprit is all the garbage that students and others at RWTH fed him. It is not known how long that Loui had been hanging out at RWTH but since the Aachener Campuskatze Facebook page has been up and running since 2010, the implication is that he spent a lion's share of his adult life on campus. 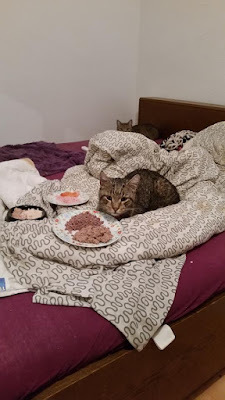 Of course, it is entirely possible that Biewer has had other cats that she purposefully dumped at RWTH long before Loui ever arrived on the scene. She most assuredly was well aware that the fare he was being fed at RWTH and elsewhere around town was injurious to his health. For example, she wrote in a May 29th post on Facebook that he had been sickened by eating Dönerkebab und Eis. Later in a June 21st posting she disclosed that she had been forced to take him to a veterinarian in Kornelimünster-Walheim, located in the southern most district of the city, after he once again had been sickened after consuming an unidentified substance. Based upon those two bits of anecdotal evidence, it is entirely possible that he had been sickened numerous times over the years after consuming scraps and garbage tossed his way by the students at RWTH, the holy men at the Dom, and others. Regardless of the exact number of times that Loui had suffered food poisoning, the failure of the attending veterinarians to have spotted the cancerous growth underneath his tongue following the poisonings in May and June is totally inexcusable and constitutes gross veterinary negligence. The most logical conclusion to be drawn from such incompetence is that the practice of veterinary medicine in Deutschland is every bit as much of a slipshod and mercenary affair as it is in both England and the Vereingten Staaten. Given that a chrondrosarcoma can metastasize extremely rapidly, it may already have been too late in order to have saved Loui's life even if the malignancy had been found and diagnosed back in May. On the other hand, it still might have been possible at that time to have surgically removed the tumor and extended his life indefinitely. As is the case with almost everything else in this world, it is extremely difficult to establish causality in medicine. For instance, in Loui's case his recent bouts of food poisoning could have been brought on by the presence of the tumor as opposed to vice versa. What Will Be Mia's Schicksal? Be that as it may, Lou's life, times, and death bear a striking resemblance to those of a fifteen-year-old ginger-colored tom named Dodger from Bridport in Dorset. Diagnosed to be suffering from a leiomyosarcoma in December of 2011, he was killed off by his owner, forty-six-year-old Fee Jeanes, in early February of the following year. As Biewer later did with Loui, Jeanes had dumped Dodger in the street and that led to him being forced into spending the vast majority of his days and nights either at the bus station in Bridport or aboard one of First Bus's motor coaches. He accordingly was left to scrounge around for his daily bread. Once again, there is not so much as an iota of proof that Dodger's poor diet led to the onset of stomach cancer but at the same time that does not preclude such a possibility. 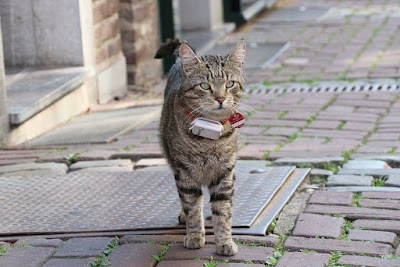 It nevertheless is irrefutable that cats should not be left to scavenge for their food and that is especially the case with those that reside in urban environments and are thus forced to rely upon garbage and scraps tossed their way in order to survive. Even those that live in the wild and subsist upon whatever live prey that they are able to snare are still susceptible to either intentionally or accidentally ingesting d-CON, antifreeze, and other toxins. Plus, most of them sooner or later either starve or freeze to death during the wintertime. It thus is axiomatic that anyone who gives so much as a hoot about the welfare of a cat is not about to entrust its sustenance to perfect strangers. That in turn leads to the supposition that both Biewer and Jeanes very well could have killed their cats through their unwillingness to take responsibility for what was fed to them. There also is another rather revealing parallel between the two derelict owners in that it was precisely Jeanes who first contacted the media regarding Dodger's exploits. As far as it is known, however, he died long before she was able to capitalize upon his newfound notoriety. Despite her declaration that she was going to find it difficult in order to go on without him, Biewer seems to not only have gotten over Loui's death rather quickly but is every bit as busy as bee these days. First of all, she immediately pledged to donate any funds left over from his care to the Aachener Tierheim und Tierschutzverein at Feldchen 26 and other unspecified charities devoted to the care and protection of animals. 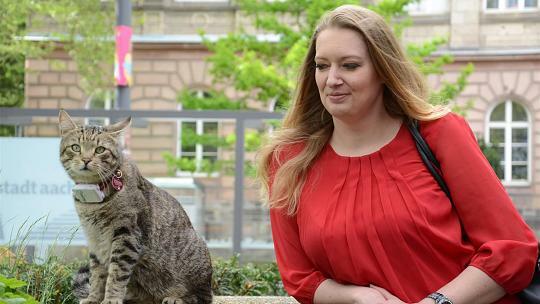 Her second project was to quickly establish the Vereingründung King Loui und Freunde which is designed to provide care and new homes for cats that need them as well as to sterilize those that are homeless. As of September 14th, the charity had collected €295 from fourteen donors and contributions can be made to it at www.leetchi.com/c/kingloui. "Loui hat das geschafft, wovon korrupte Politiker nur reden können -- Menschen vereint. Menschen aller Nationalitäten und Religionen, weil er jedem unvoreingenommenen und voller Liebe entgegen getreten ist," she wrote September 2nd on Facebook. "Es wäre ihm nur gerecht, wenn man diese Liebe auch anderen Tieren zukommen lässt, die ein ähnliches Schicksal wie er und Mia hinter sich haben." Quite understandably, it is now Mia, as opposed to Loui, who is the main focus of her life these days and the shy, brown female appears to be reveling in the attentions that are being lavished upon her. "Die Prinzessin vermisst ihren großen Freund zwar schon, aber feiert in erster Linie ihre neu gewonnene Freiheit," Biewer wrote August 28th on Facebook. "Loui ist ihr gegenüber doch reicht dominant gewesen und jetzt ist sie halt der Chef im Haus." That last statement is a little bit difficult to believe considering that Loui was so seldom home. 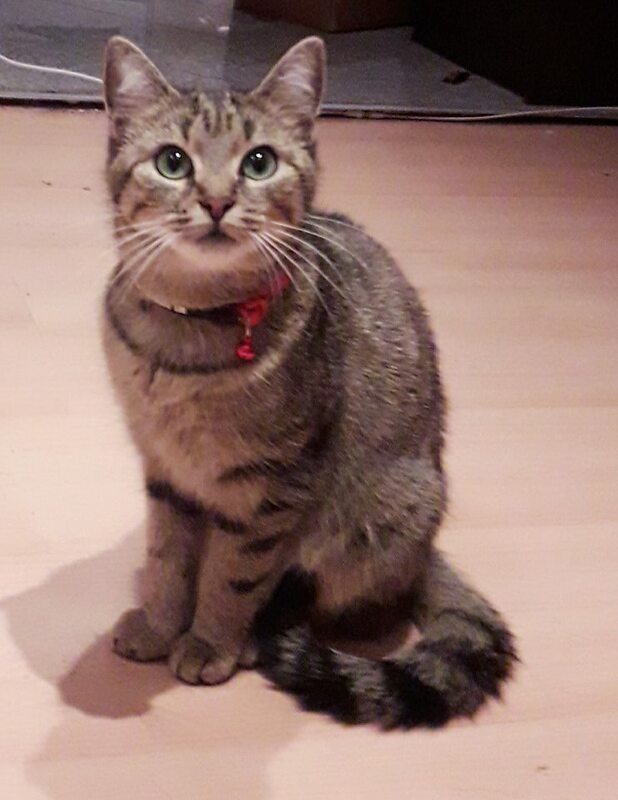 It also is disturbing that Biewer has tried out a red collar on Mia because that could imply that she is contemplating turning her loose in the street as a replacement for Loui. The recent arrival of a pet stroller from a friend in London hopefully has put those plans on hold. 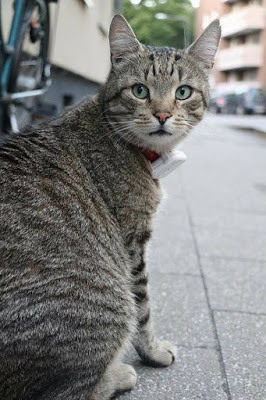 That is especially the case given that the streets of the Innenstadt are too clogged with vehicular traffic to make it healthy for any cat to roam without a chaperon. That is especially the case given that even bicyclists and pedestrians are being run down on an almost daily basis. There is not any point in searching for heroes in this tragic tale because there are none to be found anywhere. If there had been any Loui, quite obviously, would still be alive today. Rather, the dramatis personae is comprised solely of a thoroughly reprehensible aggregate of naked exploiters of cats. In following Loui's trials and tribulations over the course of the past few months he always has appeared to be much like a frightened deer in the headlights of an oncoming motorist, never knowing quite which way to turn. Regrettably, no knight in shining armor ever came to his rescue and, with the deck stacked so heavily against him, it was only a matter of time until he met his Waterloo in one form or another. That is all water underneath the bridge now and there is absolutely nothing that can be done in order to either rectify the wrongs that were done to him or to bring him back. He is gone and it is forever. This wicked and uncaring world keeps right on turning, however, and life goes on, at least for those who still have the stomach for it. The chief characteristic of any halfway intelligent individual is a willingness to learn from past mistakes but in this instance it most definitely cannot be said that either Biewer or RWTH have learned anything worthwile from what they did to Loui. It therefore is their destiny to continue to perpetrate the same outrageous offenses against other cats in the future just as they have done against Loui. Photos: Katharina Menne of the Aachener Zeitung (Loui with a tracking collar and with Biewer), Facebook (Loui in the street, in bed, and looking scared), and RWTH (Loui in class).